Last week we told you how to see Buddies on your Oudie with help of the Open Glider Network (OGN). This week we put these new features to a real-life test. Weather forecast was phenomenal. The Alps were promising strong thermals, high cloudbase and no overdevelopment. Sounds like the right day to take inexperienced pilots for their first cross-country flight? That’s what we did! The team consisted of a DG 500 with Luka and Andrej, DG 100 with Iztok and a DG 300 with another Luka, the photographer. 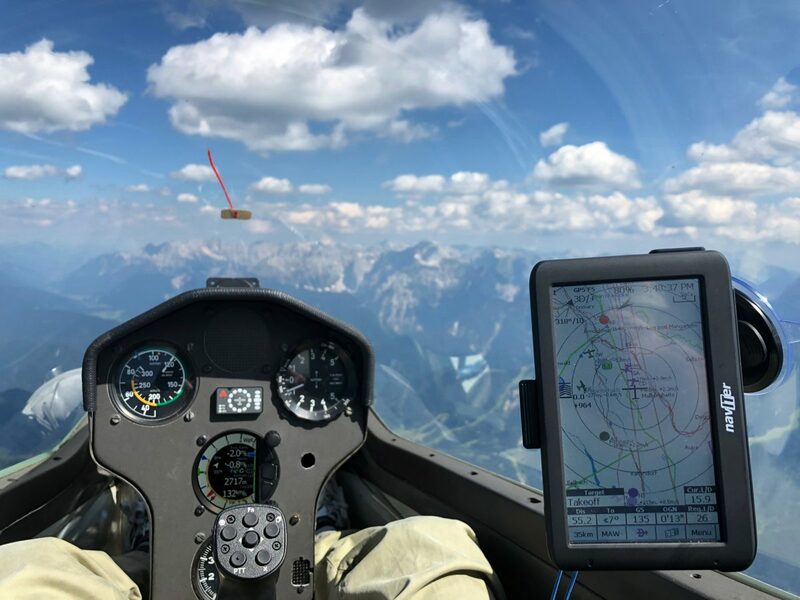 Since we are Naviter we don’t just fly for fun, we test the hell out of our products in the sky.
. Push gliders to the runway and Go! It didn’t take long before the instruments were pegged. While we were climbing in the crazy strong early thermals, Iztok was struggling after release. It was very tempting to ask how he was doing, watching his shadow almost touching trees down in the valley. But since we could see him on our Oudie, we could spare him that radio call. We knew his altitude and we knew that he was climbing steadily with 0.7 m/s. Sure enough – soon his vario jumped to 1.9 m/s on our Oudie. Time to start the adventure!
. Your Oudie can also function as a flying OGN receiver, extending OGN coverage in areas without ground antennas?